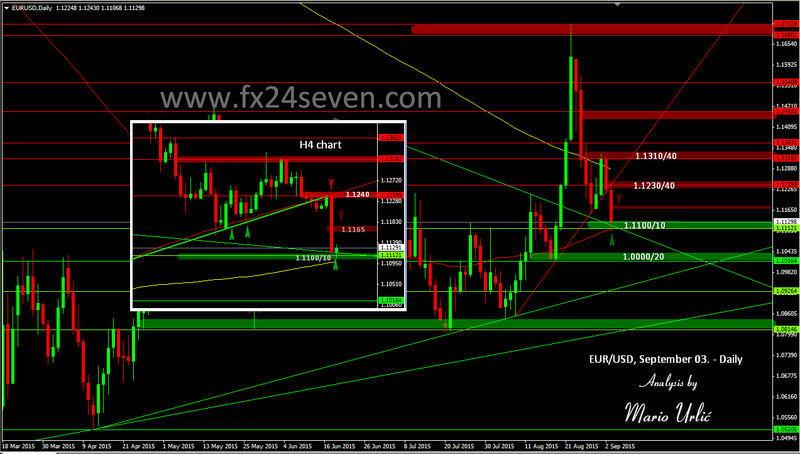 EUR/USD, fall during the press conference! The market players were right, lower forcast and revision of growth from ECB shake the euro. On the main currency pair EUR/USD, daily MA100 and trendline stoped the fall at 1.1106, after wich the euro rebounded back to 1.1150. There is minor resistance now at 1.1150/65 after wich comes the stronger one at 1.1230/40, the resistance from this morning. On this small H4 chart, you can see the fall after the trend line was broken, the same trendline wich was support for the euro for the last three days. I pointed on that up trendline in my previous EUR/USD analysis from August 31. The pair looks bearish now, it’s question could this level at 1.1100 hold another attack. Closing the day bellow could give additional boost to the US dollar. Watch this levels carefuly.